Madagascar is a large island located in the Indian Ocean, and has a tropical climate, rainy along the east coast, arid in the south-west, and temperate in the mountains. In inland areas, mountain ranges mitigate the climate, while rainfall varies depending on slope exposure. Being in the Southern Hemisphere, the country has reversed seasons compared with Europe or North America. In the whole country, there's a rainy season from November to March, which, however, produces little effects in the southwest, which is therefore arid. On the other hand, in most of the country, there is a dry season from April to October (or from May to September in the north), except on the east coast, where it rains all year round. As is typical of tropical areas, the rains usually occur in the form of thunderstorms, especially in the afternoon, so there's no shortage of sunshine even in the wettest months, at least in the morning hours. In the cool period, from mid-May to September, but sometimes also in October, cool air masses from the south-west can affect the country, bringing a bit of cool weather at night, especially in the center-south, and even cold in inland areas. The country is very interesting, not only for the beauty of the landscapes, but also for its flora and fauna. In fact, having been separated from the African continent millions of years ago, it has a great biodiversity and many native species. In the far north, in the northern tip of Madagascar, it is hot all year round, while the rains are quite contained, hovering around 1,000/1,200 millimeters (40/47 inches) per year. 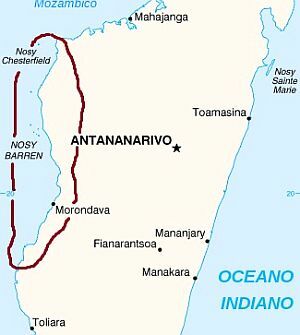 In Antsiranana (or Diego Suarez), it is hot all year round, although the temperatures slightly drop from June to September. Here are the average temperatures. 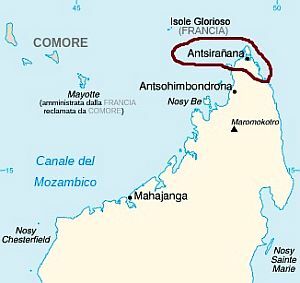 In Antsiranana, 1,200 mm (47 in) of rain fall per year, and rainfall is abundant only from December to March. Here is the average rainfall. The sun in Antsiranana regularly shines in the long dry season, while in the summer rainy season, the sunshine hours decrease a little. 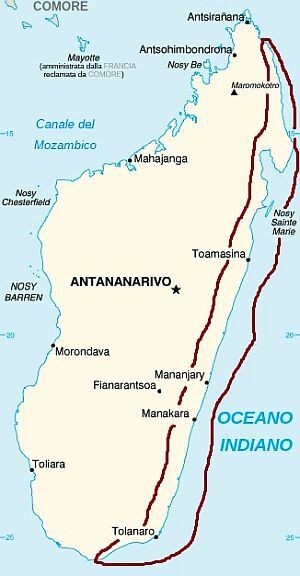 The sea temperature in Antsiranana remains high enough for swimming even in winter, since it only drops to 25 °C (77 °F) from July to September. On the north-west coast too, temperatures are high all year round, but being that it's directly exposed to the northwest monsoon, the rains are more abundant, so much so that they exceed 2,000 mm (80 in) in some areas. In Nosy-Be, an island located a short distance from the coast of Ambanja, the decrease in temperatures from May to August is limited. Here are the average temperatures. Not only the period from November to March is rainy, but it's also hot and muggy. We are in the austral summer, a season when the country is divided into two: in the north, the north-west monsoon prevails, bringing heavy rains along the north-west coast, where rainfall is around 400/500 mm (16/20 in) per month in January and February. Here is the average rainfall of Nosy-Be. The sun in Nosy Be shines very often in the dry period, from May to October. On average, there are almost 3,000 sunshine hours per year. In this part of the coast, the sea temperature is high throughout the year, as we can see in the following table. Going further south on the north-western coast, the climate remains similar, even though the rainfall is less abundant: the summer remains very rainy, but it's a little shorter. Moreover, for a long period, from May to October, it almost never rains. Here is the average rainfall in Mahajanga. In Mahajanga, it's hot all year round, but the temperature drops a little from June to September, especially at night. Here are the average temperatures. The sky in Mahajanga is normally clear in the long dry season, while the sunshine hours decrease a little in the rainy season. There are as high as 3,200 sunshine hours per year. The sea temperature in Mahajanga remains high enough for swimming throughout the year, as we can see in the following table. On the west coast, the temperatures in the austral winter decrease, becoming cool during the night. Furthermore, the west coast is not as rainy as the north-west coast, in fact, the rainfall hovers between 700 and 1,000 mm (27 and 40 in) per year, compared with the 1,500/2,000 mm (60/80 in) of the northwest coast. In Morondava, the average temperature ranges from 27.5 °C (81 °F) in the December-February period to 21.5/22 °C (71/72 °F) in the June-August period. Here are the average temperatures. Precipitation in Morondava amounts to 765 mm (30 in) per year; the rains are abundant for a short period, from December to February, while there is a very long dry season, from April to November, when it almost never rains. Here is the average rainfall. The sun in Morondava shines very often, and it shines for many hours even in the rainy season. In an average year, there are as many as 3,500 hours of sunshine. The sea temperature in Morondava remains high enough for swimming even in winter, since it drops to 25 °C (77 °F) from July to September. 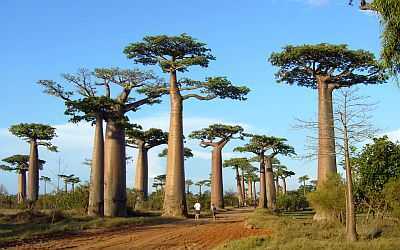 Near Morondava, we find the famous Avenue of the Baobabs. On the south-western coast, rainfall diminish further, so much so that it drops below 500 mm (20 in) per year. In fact, in the austral summer, the south-east trade winds still blow in the south of the country, bringing rainfall along the eastern side, but it is much less intense in the south-west. In winter, on the other hand, temperatures drop quite sharply, especially at night, when it gets cool, also because from June to September, and sometimes even in May and October, this area is directly exposed to cool air masses that may come from South Africa. 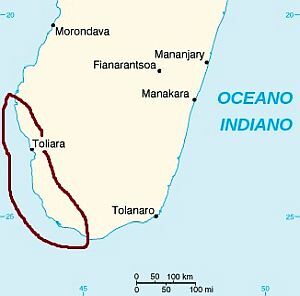 In Toliara (formerly Tulear), just north of the Tropic of Cancer, only 420 mm (16.5 in) of rain fall per year, with a maximum of around 90 mm (3.5 in) per month from December to February. Here is the average precipitation. In the southwest, which in summer is the hottest area of the country, the temperature can reach 40 °C (104 °F) from December to March. Here are the average temperatures in Toliara. The sun in Toliara regularly shines throughout the year, so, the amount of sunshine remains very good even in summer; there are up to 3,600 hours of sunshine a year. The temperature of the sea in the southern part of the coast reaches 23 °C (73 °F) in August, so, all in all, it remains warm enough to swim in even in the winter season. As mentioned, during winter, the south-east trade winds prevail, and they are cool and dry everywhere except along the east coast, where they release the moisture which they have previously picked up over the ocean. For this reason, on the east coast and on the first slopes near the coast, it rains throughout the year, and a tropical forest flourishes there. In Toamasina (formerly Tamatave), 3,350 millimeters (132 inches) of rain fall per year. In March, which is the rainiest month, rainfall exceeds 400 mm (16 in). The only period when the rains are not too heavy is from September to November, and this is true in general for the entire east coast. Here is the average precipitation of Toamasina. And here are the average temperatures of Toamasina. You can notice the decrease during the austral winter: in July and August, the daily average is 21 °C (70 °F). On the east coast, the sun does not shine very often, since the rains are frequent all year round. However, the sunniest season is the winter, from May to August, when the trade winds directly hit the coast, while the sunniest months (albeit slightly) are October and November. The temperature of the sea on the east coast is high enough for swimming all year round, although it decreases a bit from July to October, as we can see in the following table. 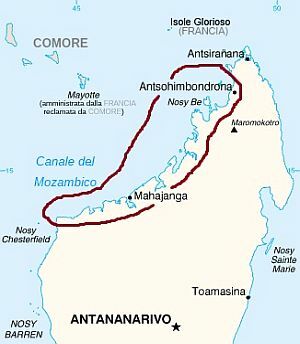 To the north of Toamasina, we find an island, Sainte-Marie, otherwise called Nosy Boraha, which is located in this very rainy area and is covered by forests. 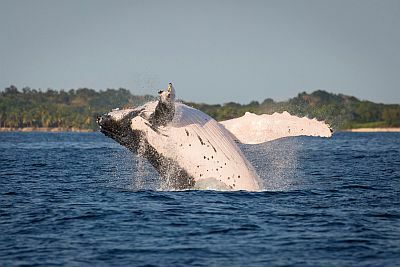 Between July and September, the humpback whales that come from the Antarctic seas and congregate for breeding in the channel between the island of Sainte-Marie and the coast of Madagascar, are often observed in a rainy context. Near Île Sainte-Marie, there is another smaller island, Île aux Nattes (or Nosy Nato). Along the east coast to the south of Toamasina, precipitation decreases gradually, even though the trend is similar, with rains distributed throughout the year, and a relative minimum in September and October. So, rainfall amounts to 2,500 mm (98 in) in Mahanoro and to 2,100 mm (83 in) in Manakara. In the southernmost part of the east coast, in Tôlanaro (or Fort Dauphin), rainfall drops to 1,700 mm (67 in) per year; it remains below 200 mm (8 in) in every month, and drops to 75/100 mm (3/4 in) per month from August to October. Here is the average rainfall. Average temperatures in Tôlanaro do not vary by much compared to those of Toamasina, however, the June-August period can be a bit cool for a beach holiday. Here are the average temperatures. Since the rains are less frequent in winter, the amount of sunshine in Tolanaro does not decrease much, so there are 7/8 hours of sunshine a day even in the period from June to September. The sea remains warm enough to swim in even in winter, although it decreases to 23/24 °C (73/75 °F) from June to October. As mentioned, the climate in the interior of the country is tempered by altitude, at least at intermediate elevations, while above 2,000 meters (6,500 feet), the temperature during winter can drop below freezing (0 °C or 32 °F), especially in the south. In the dry season, a wind that is able to raise dust from the parched ground can sometimes blow on the plateau. On the other hand, in the rainy season, the rains can make it difficult to get around on unpaved roads. In the interior, there are also mountains. The highest mountain is Maromokotro, 2,876 meters (9,436 feet), located in the north of the island, in the Tsaratanana Massif. On the other hand, in the south, to the south of Fianarantsoa, in the Andringitra National Park, the highest mountains reach around 2,500 meters (8,200 feet). The capital, Antananarivo (formerly Tananarive), is located at 1,300 meters (4,300 feet) above sea level, and has a pleasant climate, in fact, the average ranges from 21 °C (70 °F) in the summer months to 15 °C (59 °F) in July and August. Winter is therefore pretty cool. Here, the best months are April, September and October. In Antananarivo, 1,400 mm (55 in) of rain fall per year, most of which occurring from November to March. Here is the average precipitation. In Antananarivo, the amount of sunshine is moderate; however, it reaches a maximum from September to November. Further south, in Fianarantsoa, at 1,200 meters (3,900 feet), the climate is similar to that of Antananarivo. In the warm season, Madagascar may be affected by tropical cyclones, which can form in the South-West Indian Ocean from November to mid-May, although they are more likely from late December to mid-April. Some intense cyclones that hit Madagascar were Gafilo in March 2004, Giovanna in February 2012, Enawo in March 2017, and Idai in march 2019. 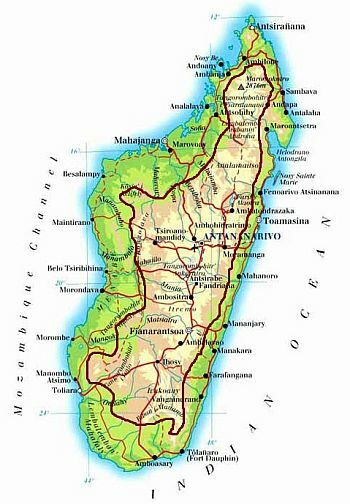 The best time to visit the whole Madagascar, to go on excursions in search of the numerous flora and fauna attractions, corresponds to the months of September and October: in this way, you can avoid the heat but also the rains and the possible cyclones of the austral summer. The period from June to August can be good as well, although it's very rainy on the east coast, and can be cold in inland and southern areas (however, as we said, sometimes it can get a little cold also in September, and more rarely, in October). For a beach holiday, the west coast is preferable to the east coast because it's sunnier and less rainy. Anyway, you can go from mid-May to October on the west coast, and in September and October on the east coast. As regards to the west coast, you can distinguish between the northern part, the one facing north-west (see Mahajanga, Nosy-Be, Antsiranana), which is warm throughout the year, and the central-southern part, which, in winter, can sometimes be reached by cool air masses from the south and can experience cold nights (see Toliara); therefore, in the latter it's preferable to go in September and October, while if you intend to go in July or August, in order to avoid surprises, you can choose the northernmost area. In Nosy-Be, you can go from mid-May to October, although in October a little atmospheric instability begins to occur, with the first afternoon thunderstorms. If you prefer to go in summer, for example at Christmas, it being understood that the weather is hot and there is the risk of cyclones, you can choose the least rainy area, that is, the south-west (see Toliara); in the southern part of the east coast (see Fort Dauphin), all in all, it does not rain very much, even though it depends on the year. In winter (June to August): on the south-central and the eastern coast, bring spring/autumn clothes (light for the day), a sweater and a light jacket for the evening; on the east coast, you can add a raincoat or umbrella. On the north coast (Mahajanga, Nosy Be), bring light clothing, a sweatshirt for the evening, and a scarf for the breeze. In Antananarivo and the plateau, spring/autumn clothes, a jacket, a sweater and a hat for the evening, and a scarf for the wind. In summer (December to February): throughout the coasts and inland areas at low altitudes, bring light clothing made of natural fibers, a sun hat, a light sweatshirt for the evening, and a light raincoat or umbrella. In Antananarivo and the plateau, light clothes for the day, a sweatshirt and a light jacket for the evening, and a raincoat or umbrella.